Michale Graves, the iconic punk-rocker who once fronted one of the world’s most legendary punk rock bands, The Misfits, continues his Course Of Empire tour across North America for the remainder of 2018. Joining Graves for the North American tour is fellow punk rocker Argyle Goolsby, and horror punk vocalist Nim Vind. The Course Of Empire tour will continue into 2019 making its way thru Europe with multiple stops in the UK, and then onto Ireland and Holland. Joining Graves for the European leg of the tour will be The Crimson Ghosts, Noise Pollution, Witches of Doom, & Acid Muffin. Since 1995, Graves has toured to numerous countries, playing hundreds of shows, all the while paving his way through the Punk Rock scene worldwide. 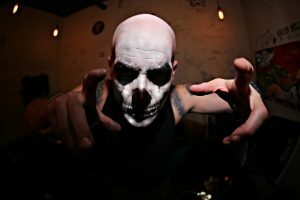 Michale Graves continues to take his artistry to the next level, with every project he’s shared to the world being nothing short of moving and inspiring. While entertainment is at the heart of who he is as a performer, Graves is also a social and pop-culture media thought leader who has hosted, as well as appeared on numerous broadcast and print media worldwide, while continuing to develop his own voice offstage. Graves will always continue to seek new ways to innovate the industry, promote well-being, and uplift the individuals through art and entertainment. OCT 10 Big Dipper / Spokane, Wash.
OCT 11 Club Sur Rocks / Seattle, Wash.
OCT 13 Paris Theatre / Portland, Ore.
OCT 16 Holy Diver / Sacramento, Calif.
OCT 19 Whisky A Go Go / West Hollywood, Calif.
OCT 20 Full Circle Brewing Co / Fresno, Calif.
OCT 21 Brick By Brick / San Diego, Calif.
OCT 24 Club Red, Mesa, Ariz.
OCT 25 Green Room / Flagstaff, Ariz.
OCT 26 Beauty Bar / Las Vegas, Nev.
OCT 28 Many Farms Bingo Hall / Flagstaff, Ariz.
NOV 01 Herman’s Hideaway / Denver, Colo.
NOV 02 Sister / Albuquerque, N.M.
NOV 13 Side Tracks Music Hall / Huntsville, Ala.
NOV 15 Iron Oak Post / Melbourne, Fla.
NOV 16 Nighthawks / Jacksonville, Fla.
NOV 17 Brass Mug / Tampa, Fla.
NOV 18 The Haven Lounge / Winter Park, Fla.
NOV 21 Hell at The Masquerade / Atlanta, Ga.
NOV 23 The Hideaway / Johnson City, Tenn.
NOV 24 Cosmic Pete’s / Parkersburg, W.V. NOV 25 Uptown Pinball / Martinsville, Va.
NOV 29 Broken Goblet Brewery / Bristol, Pa.
NOV 30 Revolution Bar & Music Hall / Amityville, N.Y.